This recipe makes 6 fairly large waffles. In a large bowl, mix together the flour, sugar, baking powder, salt, cinnamon, nutmeg and cloves. In a separate smaller bowl, beat the egg yolks and mix in the applesauce, milk and vanilla. In the third and final bowl (glass or metal preferred), beat the egg whites until stiff peaks form. 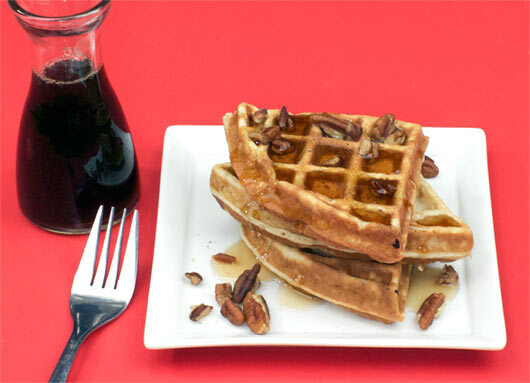 This is an important step if you want your waffles to be fluffy. Add applesauce mixture to the dry ingredients and mix well. Mix in the melted butter. Fold in the egg whites. Cook according to waffle iron instructions. I recommend using a generous amount of cooking spray even if your waffle iron's instruction booklet doesn't mention it. Serve with a pat of butter and your favorite topping. 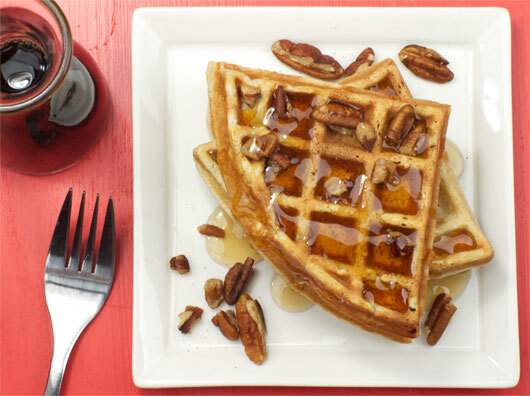 I like this recipe not just because it taste good, but also because the applesauce takes the place of the vegetable oil that many other waffle recipes have. Recipe number 1833. Submitted 9/10/2006.